A2600 Riddle of the Sphinx (USA) in 01:37.41 by Samsara. As the Pharaoh's Son, it is up to the Prince to lift the curse of Anubis, God of the Dead, by reaching the Temple of Ra and solving the riddle of the Sphinx. Armed with a sling and some rocks, the Prince journeys across Egypt, trading with nomads, digging for treasures, and calling upon the goddess Isis for counsel and healing. 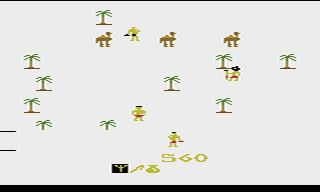 This run by Samsara uses the Sceptre to move faster, and carefully manipulates nomads, Isis, and the Sphinx to finish the game in the fastest time possible.